Interviews with newsmakers and personalities from across the globe. Gavin Esler speaks to South Africa's Chief Justice, Mogoeng Mogoeng. 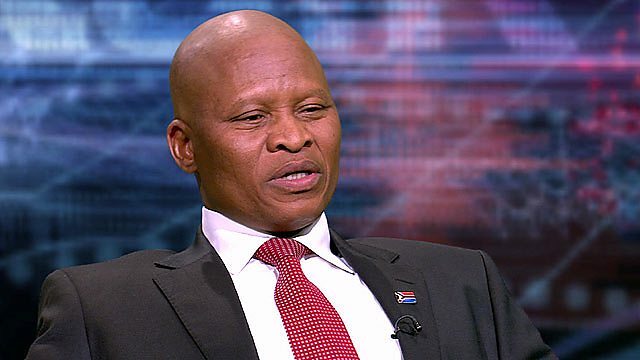 Browse content similar to Mogoeng Mogoeng - Chief Justice of South Africa. Check below for episodes and series from the same categories and more! little is being done for empowering women. Is that not your job?No. commitment to equality? You need more women, for example. Definitely. are women. That is not good enough if you're promising equality. consensus? It is not there. Many think it is a defective process. has become politicised? People say yours was a political appointment. when people perpetuate stereotypes in total disregard of the facts. response to what the judges resolved should be done in 2011. That is the establishment of more sexual offences courts. rulings as a judge had undermined the prosecution of the crimes. ignore the other judgements that the three might have given rise to. It is about perception. It is about being seen to take things seriously. fault and refuse to see facts, it will forever be a live issue. and say you would get this job? prophet. I spoke to a prophet. religion. It is unfortunate that people mock the religion of others. Nothing that people say will cause me to depart from my faith. fact that black people do not have land that they could perhaps have. South Africa will change. Does it anger you, the slowness of it all? Since the end of apartheid, almost 20 years ago, South Africa's Constitution has become one of the most admired in the world - progressive, transformative, guaranteeing equality and human rights. But despite the great strides the country has made, the reality is failing to live up to the promise. The legal system, which guarantees the Constitution, has itself come under fire from within the government, the opposition, and from some human rights groups. Gavin Esler speaks to South Africa's Chief Justice, Mogoeng Mogoeng.